The components are part of two low pressure risers for an oil platform. The finished risers were destined for a set of twenty wells being drilled in the North Sea off the coast of Norway. It is a brand new development for a low pressure section of pipes to deal with any drill fluids and shallow gas that they may encounter while drilling the first top-hole section of a well. The component acts as a conduit for drilling fluids and equipment during the top hole section and ensures that in the event of gas passing up through the well it can be contained and routed to the rig diverter where it can be vented to atmosphere. The risers need to have a sealing ring groove in the end of the flange, which is inlaid with an extremely hard, corrosion resistant Inconel 625 alloy. 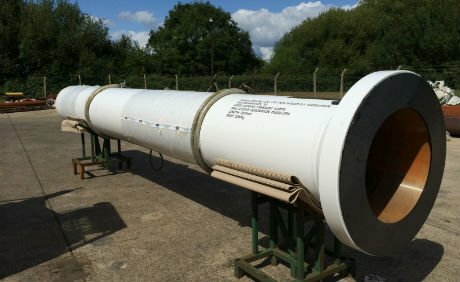 As Aquaterra Energy has previously used Arc Energy Resources for specialist welding requirements, it approached the company again with a view to provide full supply of materials, carry out all required welding, inlaying of the flange, testing and coating. Arc Energy Resources sourced the machined flanges and clad with Inconel 625, before completing the welding requirements for the project using Submerged Arc Welding – a process that provides a high quality finish. Once welded, the parts were pressure tested. Domed end caps were welded onto the straight pipe lengths and then both joints were sealed together through adjoining flange faces to form a complete vessel. For the first stage of pressure testing, the riser was filled with water to a test pressure of 750psi, which provided a safe 500psi working pressure. After being held at this pressure for 5 minutes it was pressured down and pumped back up, then held for a further 15 minutes before being drained-down. When the pressure test was complete, radiographic testing was carried out to confirm that the welds hadn’t cracked or been damaged. The end caps were removed with pipe free ends being finish machined as required. The parts were then sent to be coated. The final checks for the unit were carried out by a team that included an inspector from Aquaterra Energy’s customer and their own inspector accompanied by an inspector from DNV. Following the riser’s final check the unit was ready for use. It was delivered offshore and installed in position on-time where it has since operated very successfully.